In a large mixing bowl, blend the first 6 ingredients together. In a medium bowl, combine the mayonnaise, vinegar, and sugar. Blend well until sugar is dissolved. 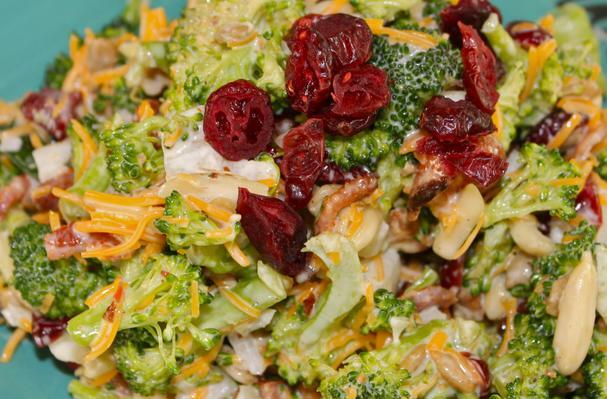 Combine the broccoli mixture with the mayonnaise mixture. So crazy-delicious! I can't wait for my husband to try it when he get home -- if there's any left!!! I'm so glad that you liked this salad ~ ~ It always disappears in this house or when I take it to parties. And it's really got a healthy side to it too, so less guilt! I need to come over to your profile/page and see what you're up to in the kitchen! Bye for now! I created my own version of a very popular salad by doubling the bacon, and using thick, smoked bacon as well. I also substituted dried cranberries for raisins that are commonly found in a recipe like this. It is a very good salad that will disappear!